Recently my father gave me a superb little book that contains three great speeches by past Native American chieftains. One speech was by Chief Joseph; one by Chief Seattle – both leaders of tribes in the American northwest; and the third was by a lesser known man named Chief Red Jacket. 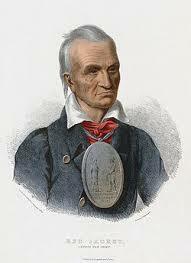 Red Jacket was of the Seneca tribe, who lived in what is now New York State and regions of Canada. Red Jacket was once called to a council in 1805 by Christian missionaries from New England. The purpose of this council was to impress and impose upon him and the Seneca tribe, the Christian faith. After the missionaries had finished their lectures, Red Jacket stood to speak. The Senecas rarely called their chief “Red Jacket.” His tribe called him “Sagoyewatha.” It means “He Keeps Them Awake,” so great were his speaking skills. And Red Jacket’s response should wake us all. In part, he said to the Christians that day: “You say that you are sent to instruct us how to worship the Great Spirit…And if we do not take hold of the religion which you white people teach, we shall be unhappy hereafter. You say that you are right, and we are lost. How shall we know [what] to believe, being so often deceived by you? What good is all our preaching and proclaiming about our faith if that faith has not changed us first? Do we have any credibility with those to whom we speak, if we ourselves aren’t better neighbors and better people – more loving, more compassionate, more generous – because of our following of Christ? See, people came to Jesus and his first followers because the way they lived actually worked. They were different, changed, and a more alive people than anyone else. And when you get around a group of people like that, you want it for yourself. You are convinced in a way that no sermon, tract, or spiritual arm-twisting can ever get near. It is a worn-out cliché (all clichés by nature are worn out), but there remains a great deal of truth in it: People don’t care about how much you know until they know how much you care. What matters at the end of it all – at the end of our careers, at the end of whatever time God gives us, at the end of our church going, preaching, giving, and doing – what matters is that we cared, and cared deeply, for the people who crossed our paths and that we served them as Christ would serve them. What matters is that we see people as people – living, breathing, laughing, crying, struggling but priceless creations in the image of God – and not as statistics or votes or sales or dollars in the coffers or names on the roll or notches in our gun or potential converts to our side of the argument or our particular strain of belief. Loving others, as Christ loves, is what matters, and that is what will infuse his followers with the credibility and authenticity so needed in the world today. Only then can we invite others to come along with us to experience the life that Jesus offers. Andrew Lincoln said the most critical task for followers of Jesus is to “make the church a place of healing for broken relationships, where divisions caused by class, race, wealth, education, age, gender, nationality, or religious traditions are overcome.” This is what Quakers call the “Blessed Community” – a society that embodies God’s peace, justice, love, compassion, and joy; an example and invitation to a better way of life. I think people everywhere would like to hear a little more about that.